The last Alpha version! The next one will be Beta and from now on we will focus on balance, polish, translation and the like. 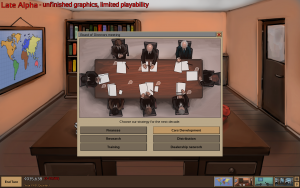 The biggest feature in this version is board of directors, a meeting organized once per decade where you can decide on a long term strategy of the company. Also other nice features. – [feature] Board of Directors meeting. It’s done once per decade and it allows you to choose a strategy your company will follow. The chosen strategy will be in effect till the next Board of Directors meeting. You can call a meeting faster (Office/Phone) but it will cost you extra. – [feature] Music changed to playlist (now the music changes during the game, chosen randomly). – [feature] Sales offices finished. – [feature] Experimental feature (need to be enabled via options), translation to Polish (unfinished!) It’s intended for testers rather than for generic public (not everything is translated), just to test if it works. – [balance] Administration and distribution costs adjusted. – [interface] Added market share bars to the world map. This entry was posted in Automobile Tycoon, New Version on November 30, 2017 by Chris.